Possessing a right view of ourselves in relationship to God will lead us to be thankful to Him for His amazing grace, so writes Keith Mathison in Chapter 14, “Transforming Grace.” “When we come to a full understanding of how serious our situation is as fallen human beings, our perspective on these doctrines changes dramatically. If we view fallen man as merely disabled or sick, we will never understand the full riches of God’s grace. When we see ourselves as God sees us, however, the truth of the matter is sobering. When we realize that we were spiritually stillborn, rebels against the Almighty and Most Holy God, the Creator of heaven and earth, wicked to our core, we will not have an overinflated sense of our own goodness and abilities. We will not delude ourselves into thinking that God chose us because of some innate goodness within us. We will not flatter ourselves in thinking that we are saved because we made the first move to come to God. 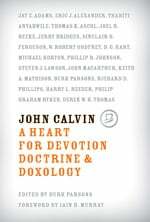 To commemorate the year of Calvin’s birth, this volume has been reduced in price to $15.09. Find it here.